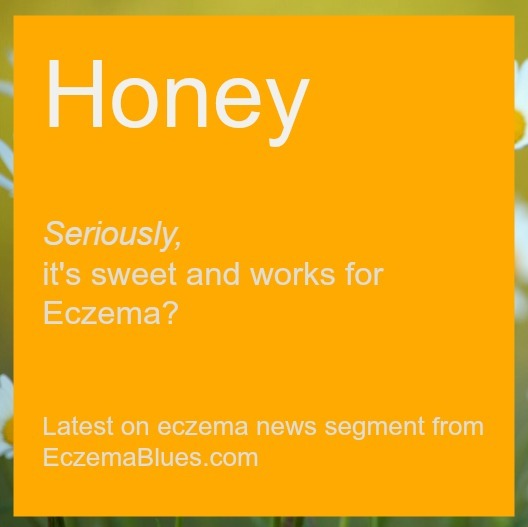 Posted byMei 15 October, 2014 10 September, 2014 2 Comments on Eczema News – Honey and Eczema : Is it Effective? Manuka Honey had been covered briefly in this blog 3 years ago when my child had Hand-Foot-Mouth-Disease. It is sometimes applied on the skin for its anti-inflammatory and skin repair properties. Is it effective as a moisturizer or as a topical treatment for eczema? Today’s eczema news look into the recent studies on honey’s impact on atopic dermatitis. What Honey are we talking? Ηoney is made up of sugars (mainly fructose), water, vitamins (B complex and C) and minerals (calcium, copper, magnesium, iron, phosphorus, potassium, selenium, chromium and zinc). It also contains amino acids, antibiotic-rich inhibine, proteins, enzymes and antioxidants (flavonoids). According to WebMD, honey is tested in the lab (not on humans) to fight bacteria (including staph bacteria common on eczema skin) and food-borne pathogens like E.coli and salmonella. However, as you’d see below, controlled trials on honey and eczema are very few and efficacy not proven. Notwithstanding, honey is often used for infected wound healing. Raw or unprocessed honey is not to be taken orally for infants for risk of botulism as their immune system has not yet fully developed to withstand the botulism bacteria. 1. Randomized controlled trial in New Zealand on Kanuka Honey – The control is aqueous cream, with 15 adults participating who were all non-allergic to honey, with eczema lesions and not using corticosteroids or antibiotics. There is no evidence of efficacy over aqueous cream, which represent a negative control as it is not recommended as eczema treatment. 2. Partially controlled study on honey mixture – this mixture contained honey, olive oil and beeswax with varying proportion of corticosteroid ointment vs Vaseline in control group. 8 out of 10 patients (out of 21) patients showed improvement after 2 weeks. However, due to the honey being mixed with other ingredients, it did not present a solid case for use of honey. Honey for its anti-inflammatory and antibacterial properties that help to decrease pain and the appearance of scars, faster wound healing. Manuka honey is reported to have the highest bacterial compound methylglyoxal to fight bacteria. Have you bought any skincare products with honey? How did it work out on eczema skin? Do share in the comment! Thanks Dr B and it’s puzzling though why none of the manufacturers of honey cream went for larger scale randomized controlled trials for eczema, maybe it’s difficult to conduct such studies! I only found the two after looking at PubMed. Have a good day!